Aspirin has been used for hundreds of years to relieve pain and reduce inflammation. It belongs to a group of chemicals called salicylates and was originally derived from the bark of the willow tree. But how does aspirin work? When you fall down and scrape your knees, how does it know that it needs to go down to your legs? When you bruise an elbow, how does it know where to go to fix that pain? First let us understand what happens when you get hurt in a fall. Your skin is covered with tiny nerve endings. Each is a little sensor that detects pressure, pain and heat. All these nerve endings communicate what they sense back to the brain. They do this by releasing chemical signals which are sent to the brain. When a nerve touches something lightly, the signal is not very strong. When you apply pressure or damage the nerve ending, it sends out a much stronger signal. Aspirin simply inhibits the release of the chemical, called prostaglandin, that creates the signal that our brains interpret as pain. In a way, the pain is still there, we just feel it less. 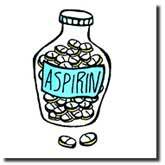 To answer our earlier question, aspirin doesn't really have any idea where to go to relieve the pain. When you swallow an aspirin it quickly gets into your bloodstream and travels throughout your body. If it finds a nerve ending that is generating prostaglandin, it interferes with its production. Something to consider is that while painkiller can reduce what your brain feels, you are still hurt. It doesn't automatically make your grazed knee better! by Robert C. Coghill, Ph.D.